So, one of the projects you are involved with is under way and soon you need to provide an update to the gatekeepers. You know, those people who approved the project and now want to know what’s going on. Depending on the tools and process used, getting a formal project update together can be a formidable task. Projects can change daily so getting the most up to date on status, issues and path forward can be time consuming. I have found that using a consistent format to provide project updates works best. The gatekeepers know that format and also when to expect updates. I have heard that many project managers don’t like gate reviews. I enjoy them and look forward to meeting with the decision makers who have a vested interest in the project. Getting them in the same room and having one conversation about the project is great. Summarizing the good, the bad and path forward is key. Regular updates on projects as it progress through each phase is a good thing. Planing for the milestone reviews helps keep the team and the sponsors in sync on where the project is. As part of the gate preparation, I review the updates with my team prior to a gate review. That way, they are aware of what is being said and can revise/improve as needed. Also, getting them in sync with recommendation(s) is also key. Last, the team knows what is the path forward and where are we in the journey to deliver the project. Be honest – provide the facts, do not gloss over things. Provide the good, the bad and the ugly. Most managers know what is going on in the area of expertise anyway so confirming what they know is a good thing. Be clear – summarize progress, current status and recommend path forward. Use a stoplight chart or milestone summary to indicate what is done, what is left and what is next. Be candid – ask for help where you need it. By being proactive and committed to success, you are indicating what is needed to keep a project on schedule. Assistance can take many forms and can include resources, applications, training and funding. 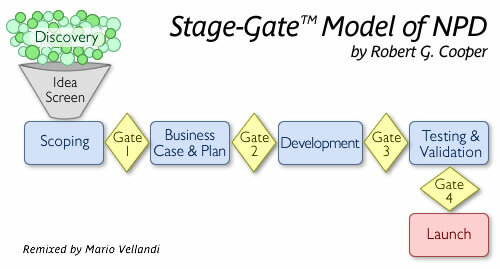 Each organization executes the phase and gate process differently. 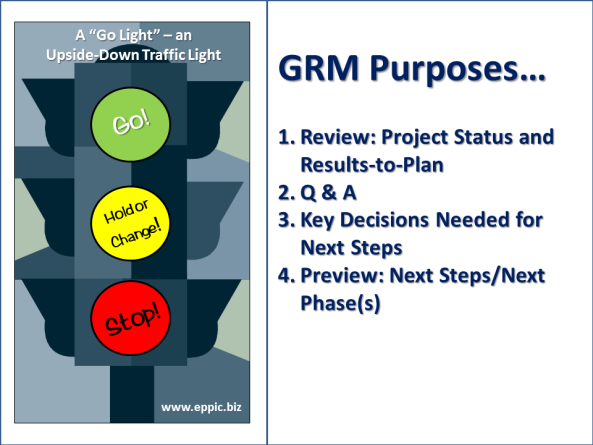 Using a stop light chart is great to visually show the project health. It also provides a way to review the top issues and how to resolve them. Getting everyone on board with what, how and who is one of the best outcomes of a gate review. The best is a pass of course and moving on to the next phase. 1) Pass – all deliverables are done for the current phase and the project is ready to move forward. 2) Fail – major issues are unresolved and need to addressed to move forward. Regroup when the issues are completed and ready to pass the gate. 3) Shut down the project. Not used as often as the first two recommendations. However, a viable and valuable recommendation when using the process correctly. This recommendation provides a way to show when a project will not succeed, does not have positive ROI and/or does not satisfy the requirements assigned to the project. When there are multiple projects in a portfolio, using the stop light chart condenses the project health clearly and provides a great visual of how each project is progressing. Typically, the project management office collects and manages this information on all projects. Use gate reviews to your advantage. Ask for help where you need it, stay on track and report progress at the next gate milestone.